What could be more fun than shooting John Browning’s classic 1911 .45ACP pistol. The old war horse bucks and roars in your hand and you’re right there in the middle of Sam Peckinpah’s Wild Bunch, one of the greatest westerns ever made. We are at the World Championship of Wild Bunch Shooting outside of Albuquerque, New Mexico. For more information, how to sign up and and a promo code, see below. 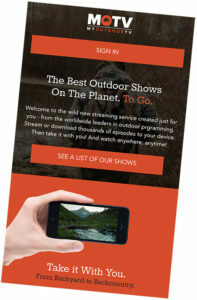 MyOutdoorTV is also available on your iPhone, iPad and Android devices. WANT MORE THE BEST DEFENSE? WANT OUTDOOR CHANNEL WITH YOU WHEREVER YOU GO? You’ll be signed up and get your first month for $0.99! 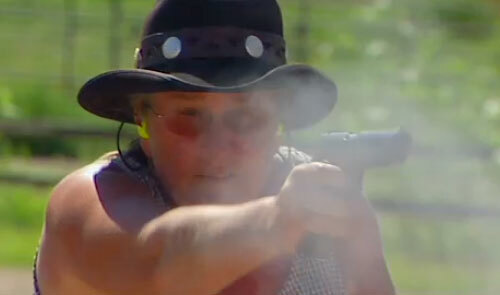 Then, for a measly $9.99 a month from then on, you get all the OUTDOOR CHANNEL you can handle. Starting in October, you also get SHOOTING GALLERY ONLINE (SGO, get it? ), an original online series that you’ll only be able to watch online. Think of the DOWN RANGE Radio podcast turned into a broadcast show. We’ll be there the first-est with the most-est! Guaranteed! Insider coverage from SHOT and the NRA Show? Done deal. Coverage of the newest technologies by people not living in their Mom’s basement? No problemo. SGO will rock.